The purpose of our life could be summed up into one right word — Happiness. Finding and unlocking the secret to lasting happiness is a duty we all owe ourselves. One way to bring happiness into our lives is fulfilling our ‘Life Goals’. We all have different goals – buying a house, giving the best education to the kids, see them building family, retirement and a lot more. Many of us also hope to achieve a level of wealth while providing for other goals. But the ultimate goal for anyone would be achieve the freedom from financial worries. This freedom is possible with smart goal-based investments. Just as people have different goals, there are investments to help achieve these objectives. 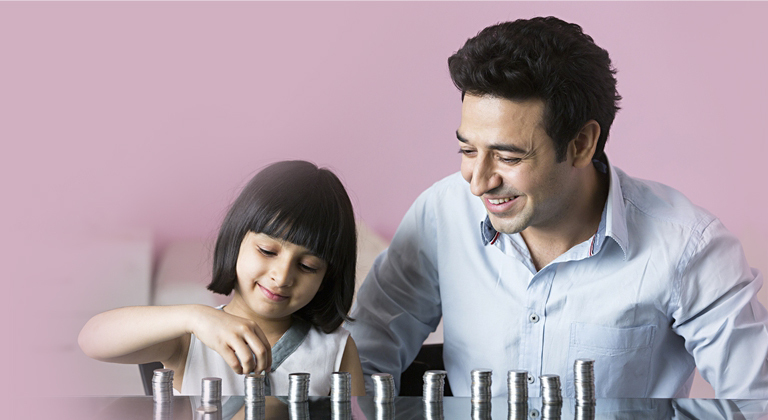 Smartly investing your hard-earned money ensures that the right amount of funds are available in the right time. What is Investment - What does it comprise of? When you invest, you commit your money or resource in the expectation of future benefits. For instance, when you want to accumulate some Rs. 20 lakh for higher-education of your child, you may need to save about Rs. 10,000 per month for next 10 years to achieve the goal. This Rs. 10,000 that you forgo now towards a goal in the future is your investment in that goal. Also, investing implies that you have committed the money to a financial product with the hopes of getting significantly more money in the future. Majority of us have a single source of income, but we have several needs that are immediate, medium term and long term. And if we start to fulfil one goal after other with our accumulated savings, we would be hardly left with anything for our long-term goals. This equation shows savings as the remaining amount after the deduction of total expenditure from total income. Mathematically, the equation gives higher importance to consumption first. However in real life, experts recommend to invest/save for future first and then manage your spends with the remaining amount. Thus, if you plan to save more money to fulfil your goals, there are only two possible options – reduce spending and increase your income. Often the former is easier than the latter. So, coming back to this question- “Why should you invest?” The answer is pretty simple - ‘You should invest to create wealth, so that your savings are safe’. And why do you need to build wealth? To deal with higher life-expectancy, which means people are living longer and therefore need more money to maintain their lifestyle. Hence, it is critical not just to have money in the savings account, but rather utilise it to make investments that enable you to create wealth over a long period. In simple terms, saving means putting aside money, bit by bit. The primary goal of saving is to preserve capital. People usually save up their hard-earned money to pay for something specific, like a vacation or a wedding, deposit on a car or house, or to cover for any unexpected emergencies. Typically, it includes the act of putting the money into cash products, such as a savings bank account. Investing involves committing your money into an investment product with hopes of making a profit. Investing is different from saving as it involves some level of risk. Investors assume this risk with the hope that they will make more money and increase the value of their investments. The potential of receiving more money is the motivation behind why you should invest in the first place. However, just putting your money in any financial instrument may not be a smart way to invest. Simply following on someone’s recommendations may not be a smart investment. 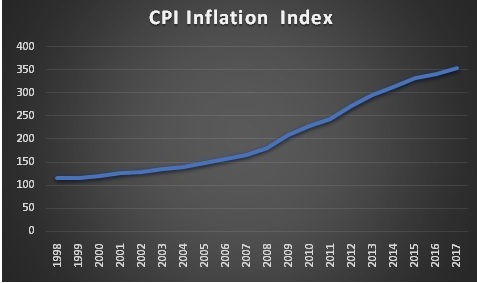 What is Inflation & How does it affect wealth? While looking at your wealth, the effect is simply reverse of the commodity price. Just imagine that if you had Rs. 100 on year ago, you could’ve bought that commodity. But if you kept this money in your pocket for a year, you would find that you are short by Rs. 5. This is why, you need to invest smartly to overcome this wealth eating monster, and it’s not difficult. Most investments can be categorised as either equity investments or debt investments. In an equity investment, a person buys a share of the ownership in a company, which entitles the investor to the profits and losses of the business. For example, if you buy a ‘Food Truck’, your profit will be based upon the net profit that the food truck generates. Similarly, if you buy shares of a company, your profit is based upon the rise (or fall) of the value of the company’s shares and the dividend which Reliance pays (if any). In a debt investment, you lend money to a business or a government institution. However, in this case, your’s business. If you buy a bond you are eligible to receive a fixed interest irrespective of the profits earned by the firm or the government. Besides above stated kinds of income (dividends in case of equities and interest in case of debt), one can also earn capital gains by sale of the investment. Due market factors the price of the equity and debt changes almost daily and the difference in the price of sale and purchase is investors’ capital gain. You can invest directly into the stocks of companies or buy the bonds issued by them and the government. Stocks are simple- they are shares of ownership in a specific company. For example, when you own a share of you own a tiny piece of that company. In general prices of stocks fluctuate with the company's fortunes, and with the changing conditions of the economy at large. Bonds are certificate of your lending money to the issuer at the said interest rate. The interest on each bond could be paid to you regularly and at the end the face value is returned. Alternatively, you can also sell the bond before expiry if you need. Investors are attracted by this investment type because of its relative safety. However, you should always check the rating of the corporate bonds, to ascertain the risk involved. Highest rated bonds and government securities often carry lower risk, but they will also offer lower rate of interest. Indirect instruments refer to the funds and instruments which invest in a variety of stocks or bonds or both on behalf of investors. Although, there are various divisions within these investments, but the most useful is the risk-return possibility in the three catogories. Understanding the risk-return profile of the three investments will help you decide when to invest in which category of instrument. We discuss this in the later part of this page. However, you should know that smart investors are always diversified into all three categories in various proportions, based on their own risk tolerance and financial needs. This too we shall discuss in detail later, but first let’s have a look at the instruments where you can invest under each category. A mutual fund is formed when money is collected from different investors and invested in a company’s stocks or bonds. Typically, a mutual fund is shared by thousands of investors and is managed collectively to earn the highest possible returns. The person driving the mutual fund is a professional fund manager. Mutual funds offer diversified investment with lower investment corpus, in any or multiple asset classes.For example, you can invest in a pure equity fund, a debt fund or a hybrid fund investing in both stocks and bonds. Mutual funds may offer various risk category funds based on the type of stocks or bonds they are investing into. Index funds are considered the safest fund category among equity funds. Whereas, Gilt funds are the safest bet among the debt categories. 1) You can invest in multiple funds under a single ULIP investment – Equity or Debt or a mix of both. Thus, ULIPs are another route to invest in a professionally managed portfolio of equities or bonds. The benefit of investing in a bond fund through ULIP is that as per the prevailing tax laws, you may enjoy tax deduction under section 80C subject to fulfilling conditions therein. ULIPs offer clear classification of risk categories, where you can pick up the higher risk fund for the long-term goals. You can gradually shift to lower risk investments as your investment nears maturity. PPF is a saving scheme offered by the Indian Government, allowing investors to deposit funds for a fixed period and earn returns on their savings. PFF investments are safe, easily accessible, simple to understand and tax-free, making them a popular investment avenue for most individuals.The interest rate offered by the Public Provident Fund is 8 percent, as applicable from 1st October 2018 (Source: Ministry of Finance). Sukanya Sammriddhi Scheme is another debt investment, which is very similar to PPF, however can be only operated by parents of a girl child. How Equity and Debt Investments Help Realize Your Goals? 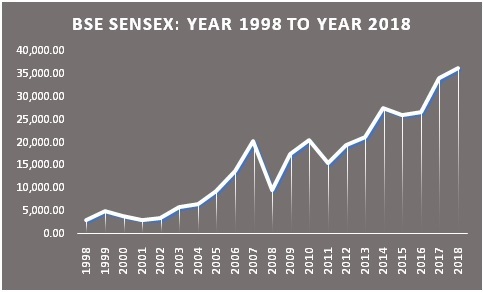 The BSE index, which was at ‘3055’ in the year 1998, (20 years ago), is at ‘36,324’today (September 2018). Meaning, it has risen at a compound annual growth rate of 13.16 percent over the last 20 years (source: Online Financial Calculator). CAGR is the compounded annual growth rate of an investment over a specific period. Imagine yourself being invested for such longer time frame in equity investments.With returns as high as 13 percent, the corpus accumulated would be enough to take care of your goals. However, due to the high volatility (risk) of equity investments, it is always good to keep some money in a debt investment. So, to meet the long-term goals, such as children’s higher education or marriage and even retirement, you can invest in a proportion of equity and debt funds. You can manage the proportionate allocation to manage the risk over time. For instance, at the beginning when you have a lot of time you can allocate 80% to equity and just 20% to debt funds. But going forward you can keep reducing your equity investment until all the money is lying in the debt funds by the time the goal arrives. Investing in equity might be a ‘need’ if you wish to beat the inflation. As the historical returns in the equity market suggest, this is the only place where you can beat inflation by a huge margin over long-term. The CAGR on the growth comes to be slightly more than 6.5%(Source: Online Financial Calculator). Compare that to the equity market CAGR of 13%. While you must allocate some money to equity to beat the inflation, you should take care of a few factors to maximize your returns and minimize risk. Today, When it comes to investing, your most powerful tool is time.You will be in for a pleasant surprise if you start investing early. This is possible because time and compounding interests play a vital role in building wealth over time. Time and compounding interest form a magic combination that can help you grow your wealth exponentially over a longer horizon. How Does Compounding Grow Your Wealth? Consider two friends Rohan and Vivek, both 30 years of age. Rohan invests Rs. 3,000 monthly towards his retirement. His investments provide him with a 10% annual return on investment and he succeeds in accumulating little over Rs. 68 lakhs at the end of 30 years. Vivek too manages to pocket an annual return of 10% on his investment. However, at the end of 10 years, he manages to accumulate only around Rs. 31 lakhs for his retirement. How is it possible? Rohan was investing merely Rs. 3,000 every month whereas Vivek was investing Rs. 15,000.Well, it is possible dueto the compounding interest and time, which has the power to multiply your money over a long period. Sometimes people delay investing until they have a significant amount of money. But this also means they give up years of compound growth. No matter how small the amount is, get your money working for you as soon as possible.This question, “How do I start investing with little money?”, shouldn’t bother if you want to secure your future. Consider the previous example of Rs. 3,000 invested by Rohan when he was30 yearsold. Pretend for a moment, he didn’t have Rs. 3,000 to invest at age 25. But he did have Rs. 1,800. If he invested Rs. 1,800 starting from the age 25, he would have almost Rs. 68 lakhs at retirement age. Almost the same amount that he accumulated by investing Rs. 3000 per month starting from the age 30. ULIPs are life insurance plans which are more vested towards investment objectives. With the help of ULIP investments, you can not only invest in the goal but also ensure that your family can achieve the goal even if anything happens to you. More than that, ULIP investments can help you a lot of tax over time. As ULIP investments qualify for deduction under section 80C, investments up to Rs. 150,000 (as per tax laws for A.Y. 2019-20) subject to fulfilling conditions therein can reduce your tax liability for the financial year. Also, as per the prevailing tax laws (lat. A.Y. 2019-20) any returns on the invested money are not taxable in ULIPs. You can withdraw partially after five years of investment without incurring any tax liability subject to fulfilling conditions therein. However, if you want to adjust the investment risk of your ULIP investment, you can do so without withdrawing money. ULIPs are quite flexible in the way investors belonging to any risk category can invest in them for a very long period. You can invest in ULIPs considering your current risk capacity and keep adjusting the portfolio as your risk profile changes. Equity funds in the ULIPs are aimed at the investors who have a high-risk appetite and want better growth over long investment term. These funds primarily invest in the blue-chip and mid-cap stocks. Considered the safest bet among the stock market, these stocks provide a relatively smooth growth to your investment. However, it is often recommended that you expect your investment horizon to stretch between 5 to 10 years for this asset class. Also, the best way to benefit from the volatility is to invest a fixed sum of money regularly, instead of large lumpsum investments. Debt funds invest predominantly in government bonds and top-rated corporate bonds. Debt funds carry lower investment risk than equity funds since they invest in safest bond securities. However, lower risk means lower returns as well. One plus side is that your investment horizon can be shorter, and you can invest lump sum money. Also, if you have a large sum you want to invest in equity funds, it is better to put the whole amount in a debt fund and then transfer slowly to the equity fund. Balanced funds fall between the safer debt funds and riskier equity funds. Unlike equity and debt funds, balanced funds invest in both equity stocks and fixed income securities in varying proportions. For example, 60:40 or 70:30. The unique quality of balanced funds is that fund managers can adjust the ratio based on the market trend. Thus, balanced funds have a dynamic asset allocation and can deliver better returns over longer periods than both equity and debt funds. However, considering that these funds carry lower risk than equity funds, you should expect lower returns than pure equity funds. Liquid funds are the safest out of all the fund options ULIPs present to the investors. Liquid funds invest in very short-term debt securities and thus carry very little risk. In fact, experts term liquid funds as a saving account, where you can park your money for a short period of time without the worry of losing it. For ULIP investors too, liquid funds can act as the safe fund to transfer their accumulated money as the investment reaches maturity. This is a very useful tactic, especially when you have been investing primarily in an equity fund. Top-up investments can be made any time before the maturity of the plan. 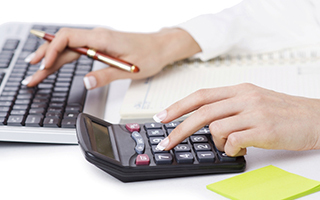 However, you should check the tax status of the additional investments. Whichever way, top-up investment option allows you to benefit from market opportunities and park your windfall gains without hassles. You can switch between two funds or multiple funds in a ULIP multiple times a year. Also, it is not necessary to switch in one go or transfer lumpsum. You can use systematic transfer instructions to transfer a fixed sum every month. Systematic transfer (STP) features allow you to invest smartly towards your goal, especially if you want to benefit from equity investments. For example, assuming you have chosen to invest Rs. 100,000 once every year in a ULIP plan. Invest the whole amount in a debt fund and submit an STP request for transfer of Rs. 8,300 every month to the equity fund. This way, you can keep investing lumpsum in the ULIP, and benefit from the rupee cost averaging in equity funds. Similarly, when you are nearing your financial goal, you can start switching from equity funds to debt funds. Along with the systematic switches you can give instructions for the systematic withdrawal of funds as well. This feature is especially useful for those who want to create an income stream while continuing to grow their investments over time. For example, once a retirement goal is fulfilled, you need to create the income stream from the accumulated money. If you have accumulated the money in a ULIP, you can simply start the systematic withdrawals whenever you want to start the income. If you are investing in ULIP now, your income will start five years from now. Many ULIP plans offer an automatic adjustment feature called dynamic asset allocation. If you opt for this feature in your ULIP investment, you may not need to care about manually adjusting risk of your portfolio. Dynamic asset allocation works based on the investment period of your plan. For example, if you start a 20-year plan, first five year will have the maximum equity allocation. In the later years the equity proportion is gradually reduced, and when your plan is close to maturity all the money is transferred to a debt or liquid fund. Dynamic asset allocation feature may eliminate the need of your intervention in the investment plan until the maturity. How ULIPs Cater to Your Insurance Needs and Goal Orientation? We all struggle to fulfill the needs of having adequate Insurance and Investment. This is where ULIPs come to rescue. Lips are perfect investment plans offering the combined benefits of Investment and a Life Cover. 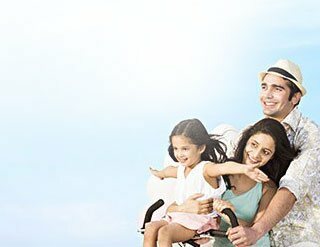 Life Cover - which pays a Sum Assured to your family after your demise. Investment–Which allows your money to earn market-linked returns and upon the completion of the policy period, you are paid a lump sum maturity benefit. This lump sum amount helps in achieving your life goals. How to Choose the Equity-Debt Allocation for Yourself? How far is your financial goal? For example, if you are in your 20s and do not have any responsibility, you can invest up to 80% of your savings into equity funds. However, you should also consider the second factor, i.e. 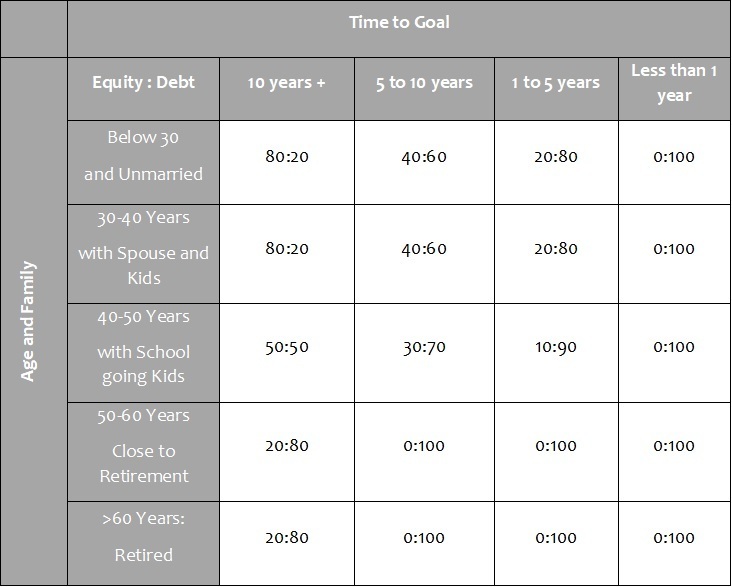 ‘time to goal’ before allocating your savings. 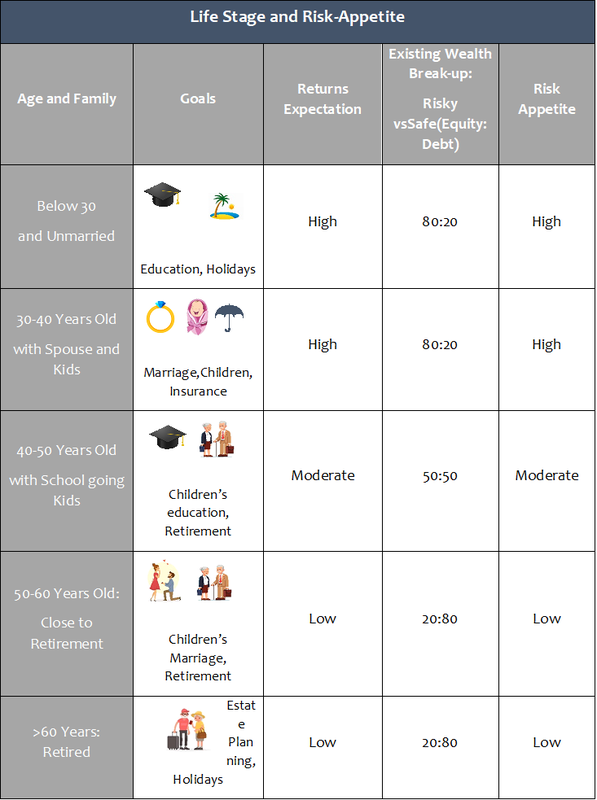 As per the table, if you are 35 years of age, you are probably looking after a family, saving for the goals of your kids, etc. At this stage if you are investing for a goal which is 15 years away, you can allocate up to 80% of your saving for that goal into equity funds. At the same time, any investment for a goal which is just about 6 years away should only get a maximum of 40% allocation to equity. Another thing you need to be careful about is the passing time. It is always good to keep a track of your investments and financial goals. Use the switch and transfer options in your investment plans to adjust your investment risk time to time. While investments like ULIPs OR SIP help you secure your financial goals, you need to ensure that the risk is within your tolerable limit. Best option is to opt for a dynamic asset allocation, which will automatically adjust your equity portfolio and ensure you have enough money. Conservative - Investors wanting stable, reliable growth and only willing to accept minimal losses are known as conservative investors. Moderate - Individuals looking for diversified or balanced investments havingthe potential for growth and are willing to accept a certain level of volatility are known as moderate investors. Aggressive - Aggressive investors generally have long-term capital growth as their focus and are willing to accept substantial fluctuations in order toaccess the highest possible returns in long-term. My husband had invested in Max Life on the recommendation of his friend. Our family expenses were totally dependent on this insurance fund for several years after his death. I must say that this insurance provided a huge support to my family during the difficult times. I came across Max Life Savings Plan a few years ago when I was researching the market for savings options. I invested in the policy soon after. The plan suits my exact requirements in terms of meeting my savings goals, sufficient life coverage, and maturity benefits.